NEW Poly Fire Pit Table. A must have for any backyard entertaining area!! 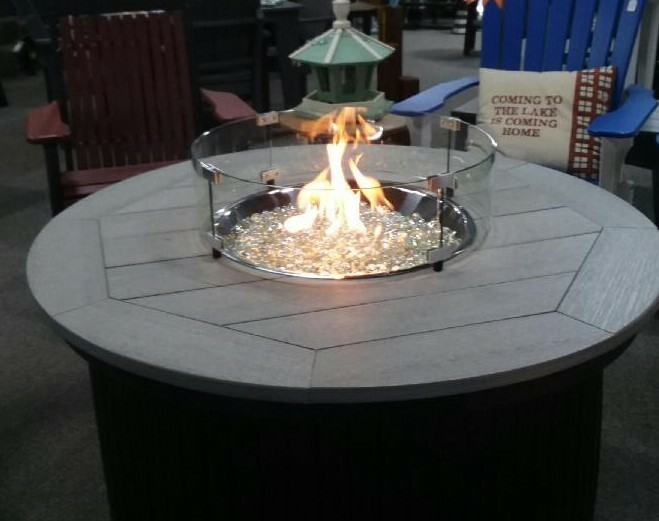 This fire pit is made with recycled milk jugs and high grade stainless steel burner assembly. Comes with the tempered glass wind guard and both the LP and Natural Gas orifice for your convenience. No more holding and balancing your food and drink while enjoying a backyard fire. The top is 48" in diameter, 27" high and a 12" table area to place your drinks and snacks. You can leave this out year round - Sun, Rain and Snow.... Anytime you wish, you can go out and enjoy the fire without having to drag out the fire pit that needs stored away!! Compare our price to others on the market and you can not beat our quality, style and price! !